Inspiration. Is it an ephemeral, elusive bit of magic? Something people lie in wait for, sometimes living life only from one flash of brilliance to the next…the time in between inconsequential and forgotten. Or is it something that is ever present? Slyly camouflaged all around us…just waiting for us to notice? I’d like to think it is that latter. That inspiration truly exists among us and can be found in the everyday. That it is precisely in the everyday where brilliance thrives. That it is inspiration that lies in wait for us, and not the other way around. It doesn’t take much to inspire me or make me smile in wonder. The scent of a mangoes ripening on my dining room table. The way bread dough comes together. Butter melting. The slight tickle of really long earrings brushing against my bare shoulder. What happens to vegetables when you roast them. Nice stationary. My baby’s giggle. My friends. And all of you. Those of you that always leave your comments here even when I’ve been terribly delinquent. Those of you that are silent but keep dropping in. You who leave helpful hints and answer my sometimes amateurish questions. You who cheer me on. You who I have met. You who I have yet to meet. Another place where I find endless inspiration is other blogs. Food bloggers’ passion, and the delicious results of that passion, never fails to inspire me. This beautiful pudding is one such example. – Rinse quinoa in a strainer for a few seconds. – Combine 3 cups of the milk and the sugar in a saucepan and bring to a simmer. – Add the quinoa and stir. Reduce heat to medium low and cook for about 30 minutes, stirring every few minutes, especially in the latter part of cooking so your quinoa doesn’t stick. – If mixture starts looking too dry, or you would like a more liquid pudding, add the extra 1/2 cup of milk. I didn’t have too although I must admit I do like a fairly squidgy pudding. – Ladle pudding into bowls, cups, or glasses (as I did here) and top with mango and pineapples. Anyone who has visited Aran’s gorgeous blog knows that it is bursting at the seams with charm and beauty. A virtual stroll through her pages always leaves me inspired. When I saw this pudding I knew I had to recreate it – not only did it look enticing, it was a quinoa version of arroz con leche (which my mum makes and I love!). I decided to make mine with our local dark muscovado sugar, whose deep molasses-y flavor got on perfectly with the quinoa’s earthiness. Instead of strawberries, I topped mine with pineapples and mangoes…our intensely sweet summer fruits. The juicy mangoes were a gift from another food blogging friend. Yet one more thing that inspires me – the generosity of food bloggers who are so willing to share even if they haven’t really “met” the person at the other end (thank you Divina!)! oh i am loving this one mangoes always gets me and paired with quinoa – wow. i think i missed this on aran's blog! but got to make it now! …and Joey you brighten our day too. I saw this on Aran's blog and have bookmarked it to try. Sounds wonderful with mango. Your blog has been an inspiration too, to all of us newbies. I'm supposed to make some brown rice pudding but the heat is just too much. But since quinoa cooks faster, I might try this soon. I'm glad you love the mangoes. You're welcome Joey. It's a pleasure. You want some avocados next time? An interesting pudding! I bet it tastes lovely! well that´s lovely, and you´re right, very inspiring. I´m in love with arroz con leche so this sounds just perfect. thanks! superb pudding. am totally gonna try it out this weekend. divina introduced me to your blog, and i've been a follower since. this is such a lovely post;one of the reasons why I always visit… i love the ordinary, mundane things… just noticing, basking the beauty of life's simple blessings just like this beautiful quinoa pudding with mango and pineapple… take a look at it… what a delightful sight! What a lovely, lovely pudding. 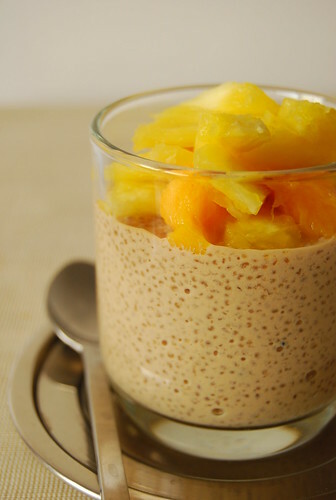 It almost looks like a sago pudding, but using quinoa is a great idea. I don't use quinoa a lot, but when I do it's always in savoury dishes. I'm going to have to try this one out though. I think you're right about inspiration being ever present and founded in the everyday. Well it certainly is for me anyway. And it's always when I take a few moments, step back from the day-to-day routine and breath that it creeps up on me. I've been thinking about trying quinoa as a breakfast food but wasn't really sure how to make it yummy. This post solves that problem. Thanks! Now that is simple and looks absolutely delicious! An alternative to champorado or goto. Hi Meeta! Right now is the perfect time over here to eat mangoes…nice and chilled to beat the summer heat! This is a great variation for it 🙂 Aran’s has strawberries and pistachios, another great combination! Hi Barbara! Aw! Thanks!!! 🙂 It’s delicious…hope you do try it! Hi Malou! Thanks so much for your kind words 🙂 When we find the beauty in the everyday, well, it simply gives us all the more opportunities for happiness! Hi Kathryn! It does, doesn’t it? But healthier! Yup, inspiration is always there waiting for us to that that “step back” and see it 🙂 Plus it’s free! Aw! Thanks Anh! Glad you enjoy it! Hi Rico! Yes, you are right, and quite a healthy alternative at that! If this pudding tastes like arroz con leche, then would cinnamon go well with it, too? And how many servings does the recipe make? I think I'm the only one at home who'll eat this, so if it makes a lot, I hope it can keep for a while in the fridge. All I can say is… damn. This is a completely new idea. I can't wait to try it. Thank you for the fabulous blog. This recipe looks to-die-for. I can't wait to try it! Hi Jo – it's you we have to thank as well for the inspiration – I never fail to get my share when I visit your blog! The pudding looks yummy… cannelle's recipes are not only gorgeous looking – they are delicious as well. Hi Ling! Thank you 🙂 I’m really loving quinoa! Hi Pippa! I’m glad you enjoyed it 🙂 Hope you do get to try it! Hi Trissa! Aw thanks so much! I’m so happy you enjoy my blog 🙂 Yes, Aran’s recipes and photos are both gorgeous and delicious! This was a wonderfully written post that it made me smile 🙂 I agree that inspiration can be found anywhere and you do not have to look for it, you just have to learn how to see the beauty in everything around you. i love this recipe but i'm not quite sure where i can buy quinoa here in cebu. i'll ask around. thanks for the recipe! This is a must-try. So glad you shared it. I've been using quinoa a lot lately and was looking for a breakfast version. It looks so good! this looks amazing! they kind of remind me of pearl tapioca! Hi Brian! Thank you! Glad you enjoyed the post 🙂 Very true! Hi Suzana! Thank you too 🙂 Hope you do get to try it out one day! I was just discussing this morning that I think Mangoes are one of the best fruits around! Love this and yes, love Aran's blog too! I love this inspiration. Pudding and mango are a match made in heaven. I have to try quinoa! Joey, don't worry about it. You're not delinquent at all and even if you were, you've got Lil C to take care of. Take your time and we'll always be here to enjoy your posts. I'm glad I saw this one – those are two of my favorite fruits ever, tag-teaming on a delicious pud! I may have glossed over a comment but where can u buy quinoa in manila??? Hi Manggy! Thanks! Life certainly did get much busier! 🙂 But in a wonderful way 🙂 These are my two favorites also! I never thought of putting quinoa in a pudding. This is a great idea. What a good way to get your protein! You got a great food blog, very inspiring. Can't wait for mango season. Veganized of course. I'm recently obsessed with quinoa. I simmer mine in almond milk at a quinoa/milk ratio of 1/2, and then add raw honey, toasted pecans, bananas and strawberries. I literally eat it every morning. Your blog is beautiful. Glad I found it! That looks nourishing and refreshing at the same time. And I'm actually doing a demo on how to make dark chocolate truffles with lavender infusion! Wow, it looks good.. I'll see if I can recreate the recipe at home… Then I'll pot it on a site my friends and I recommend – Its called Yummy Cebu – check it out its great!!! Hello Melange a Trois! That sounds so good!!! Hi Midge! So sorry I missed that…sounds divine! Hope it all went well! Man, that looks tasty! Been searching for Quinoa for a while but my supermarkets don't carry it, I'll most likely have to make a special trip to get some soon or order online. I've been dying to try some. Hmmm, I love homemade pudding and pudding with mango – that's heaven 🙂 I simply have to try this one 🙂 Thank you for sharing. I have just stumbled upon your website and I love it! The recipes are fantastic and your style of writing is beautiful to read. I can't wait to try the quinoa pudding! Oh i love the photographs, they show so much detail. wow that looks very good- is quinoa something like tapioca? Truly blew my mind here. Never considered (and now i feel silly for it, of course) this style of preparation with Quinoa. Its a wonderful grain, but i've recently run dry on new ways to put it to use. Thanks for the inspiration, immensely helpful! This one looks really delicious. I would love to try it. I can't wait. Mango is a favorite of mine. wow. what a great recipe. my peruvian mother in law regularly sends me quinoa from peru, i used to just boil it like rice. now this is a new way to prepare it. thanks. This looks DELISH! I've never tried Quinoa Pudding but it definitely is worth a shot. The fact that its made with mango and pineapple reminded me of some of the desserts I saw on this show called Extreme Chef that are all made from fruits contestants collect from an island.